There is a lot of confusion of “what is chiropractic”. This is an awesome message by Dr. Mercola and Dr. Billy DeMoss helping to explain the full benefits of chiropractic. Dr. DeMoss is one of the most known chiropractors educating the public and doctors worldwide about chiropractic. Dr. Mercola is an osteopathic physician who promotes alternative medicine to help people be more healthy naturally. Watch this awesome 14 minute interview so you can experience what chiropractic really provides to you! As your top Chiropractor in Freehold, we feel it’s important for everybody to know, “What is Chiropractic”. Our healthcare system in the United States is sickcare and nothing to do about health. Medicine and surgery has a place but needs to be placed as an emergency not as primary healthcare. Out of 37 developed countries, we use more medicine and surgery than every one of the others. Yet, our country is rated dead last in health. It is found that the countries that use the least medicine and surgery have the healthiest people. Those that promote healthy lifestyle are the healthiest. We need to make our healthcare system one that promotes health and wellness. believed when I was sick that I should be brought to the medical doctor. Prescribed antibiotics or other medicine was the rule of thumb. I suffered for over 10 years with a bronchial asthmatic condition. As a competitive soccer player, this was difficult especially when the weather would get colder. While running, I would have a difficult time breathing. My parents brought me to doctors that prescribed one inhaler after another with no relief. During my 4 years at Penn State, I would suffer with bronchitis every 6 to 8 weeks. Fortunately at 24 years old, I started getting adjusted and explained how the spine and nervous system could be affecting the functioning of my lungs. For the first time, I was able to breath freely and play soccer without coughing up my lungs. I’ve been getting adjusted now for 21 years and haven’t had one bought of an asthmatic attack. I went from getting sick several times per year, to rarely getting sick. My body was finally healthy! Would you like to experience true health? Would you like to give your body the opportunity to function at its best? Let us help you by removing interference from the most important system in your body! We will also guide you in other important aspects to be healthy: nutrition, exercise, hormone balance, removing toxins from the body and stress reduction! You and your children deserve the best of healthcare! Choose Chiropractic! Athletes at all levels are using chiropractic for sports injuries and to recover from the demanding workouts. Many college and professional teams even have chiropractors on their medical staff to treat patients. 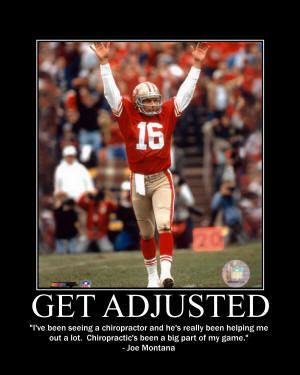 Just this past football season, athletes were seen being treated by the team chiropractor right on the sidelines. To the left you can see the Denver team chiropractor adjusting one of the players. Now, a new award-winning study further confirmed previous studies that chiropractic can also improve athletic performance. Chiropractic is giving a natural edge to the athletes. Researchers examined 18 professional Brazilian judo competitors while under chiropractic care. 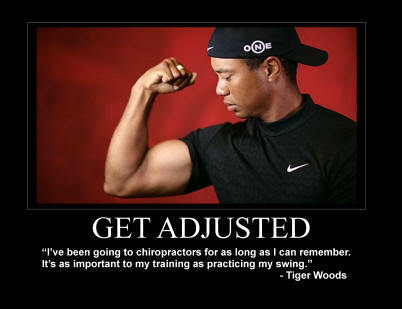 Half of the athletes received chiropractic adjustments while the other received sham treatment. Researchers then evaluated athletes’ grip strength using a device that measures muscle force. Throughout the study both groups maintained their regular workout schedule, but the chiropractic group had substantial improvements in their scores. After just three treatments, the chiropractic group improved their grip strength by 11% on the left side and 17% on their right, while athletes in the sham treatment group had only improved by 4-6%. This study is more evidence that chiropractic improves nervous system functioning, which in turn strengthens muscles. Other studies and researchers report improved reflexes, flexibility, range of motion, breathing capacity, postural strength and coordination. injury prevention and facilitating recovery. Recently NBA MVP Derrick Rose credited chiropractic for getting him back on the court after suffering with back spasms. From the worlds fastest man, Usain Bolt, to Roger Craig, Jerry Rice, Emmit Smith, Tiger Woods, Aaron Rodgers, Olympian Dan O’Brien, Mark McGwire, Sugar Ray Leonard, Roy Jones Jr, Wayne Gretzky, Billy Jean King, John McEnroe, Mary Lou Retton, Bruce Jennor, Jimmy Connors, Dan Marino, Warren Moon, Jack Dempsey to Michael Jordan just to name a few have all been under regular chiropractic care. You do not have to be a professional athlete to benefit from the edge it can provide you too. Chiropractic is great to improve your work outs, athletic performance, injury recovery and promoting healthy lifestyles and habits. If you are ready to receive the best care that pro athletes utilize, contact a local chiropractor.